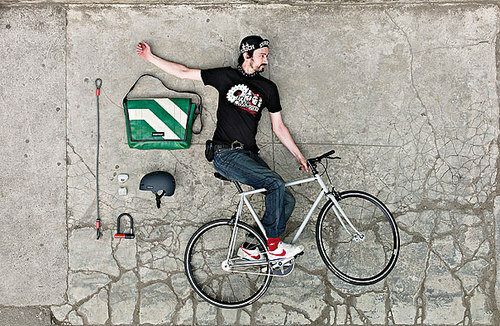 Joe Jud is the man with the legs who tested FREITAG messenger prototypes in San Francisco beginning of the nineties. At the time, most people took briefcases to work and backpacks to school. Braces were something worth bragging about. And bicycles had eighteen speeds. At least. Today, so many bags are worn across shoulders most people forget where this comes from. So just in time for summer, here’s our contribution to improve your memory, your fixness and the touristic experience of Berlin, Cologne, Davos, Hamburg and Zurich. At every FREITAG Flagship Store there are NOW five Gorilla fixed gear bikes, TSG helmets and FREITAG Bags for you to borrow for your individual tour of the city. For free! Check out more information here.